1Laboratory of Parasitology, Department of Wildlife and Fisheries Sciences, Texas A&M University, 2258, TAMU College Station, Texas 778432258, USA. 2Department of Biology, Gordon College, 255 Grapevine Road, Wenham, Massachusetts, 01984, USA. During a study of the endohelminths of wading birds from the Texas Gulf coast, 12 specimens of an undescribed species of Patagifer Dietz, 1909 (Echinostomatidae: Nephrostominae) were collected from 2 of 8 white ibis, Eudocimus albus (Linnaeus) (Threskiornithidae), from the Galveston and Brazos County areas of Texas, USA. Patagifer lamothei n. sp. 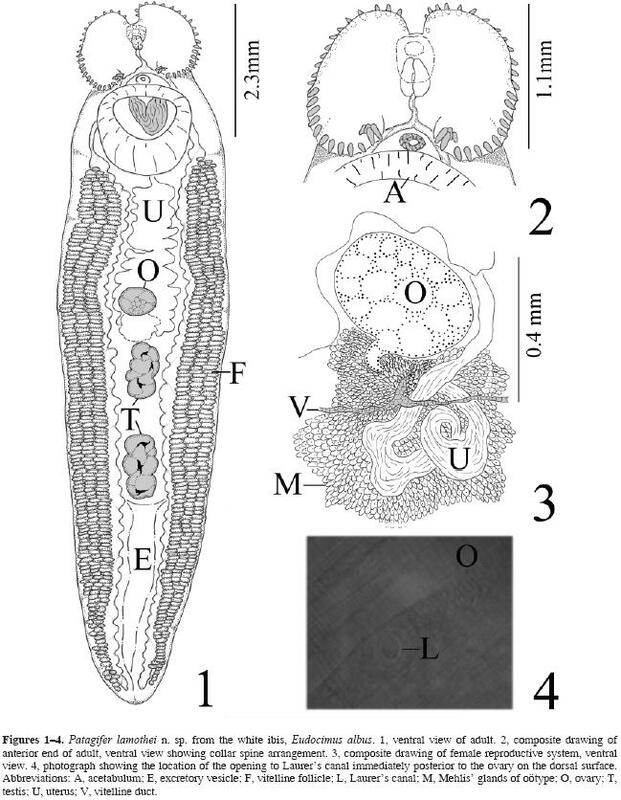 can be distinguished from P. bilobus (Rudolphi, 1819), P. brygooi Richard, 1964, P. consimilis Dietz, 1909, and P. fraternus Johnston, 1917, where the testes are close together (contiguous to nearly contiguous), the ovary is close to the anterior testis (a distance that is less than the length of the ovary), and the posttesticular space is less extensive, by having the testes separated from each other by a distance approximately equal to or greater than the length of the ovary, the ovary positioned about the length or longer of the ovary from the anterior testis, and by having a more extensive posttesticular space. In addition, the ovary of the new species is located just ahead of midbody rather than being at midbody, as is seen in P. bilobus, P. fraternus, and P. vioscai Lumsden, 1962, or below midbody, as is the case in P. brygooi and P. consimilis. The new species is most like P. simarai Nigam, 1944 in the similar distance between testes, position of the ovary, and the posttesticular space (3036% of the body length). The new species differs from P. simarai by having a smaller body size, a smaller oral sucker and pharynx, a smaller acetabulum, ovary, testes, cirrus sac, and smaller spines on the margin of the collar, but larger corner spines, and the ovary of the new species is located immediately anterior to the midbody, while in P. simarai it is located well ahead of the midbody. Key words: Digenea, Echinostomatidae, Patagifer lamothei n. sp., Eudocimus albus, white ibis, Texas, USA. En un estudio de endohelmintos de aves de los humedales de la costa de Texas, se recolectaron 12 ejemplares de una especie no descrita de Patagifer Dietz, 1909 (Echinostomatidae: Nephrostominae) en 2 ibis blancos de 8 examinados Eudocimus albus (Linnaeus) (Threskiornithidae) procedentes de los condados de Galveston y Brazos, Texas, EUA. Patagifer lamothei n. sp. se puede distinguir de P. bilobus (Rudolphi, 1819), P. brygooi Richard, 1964, P. consimilis Dietz, 1909, y P. fraternus Johnston, 1917, por la posición de los testículos, contiguos o casi, por la distancia entre el ovario y el testículo anterior que es menor que la longitud del ovario, y el espacio postesticular que es menos extenso, por tener el espacio intertesticular aproximadamente igual o mayor que la longitud del ovario, por el ovario ubicado a una distancia del testículo anterior igual o mayor que la longitud del ovario, y por tener un espacio postesticular más extenso. Además, el ovario de la especie nueva se localiza justamente delante de la mitad corporal, a diferencia de P. bilobus, P. fraternus y P. vioscai Lumsden, 1962, en los cuales se encuentra en la mitad del cuerpo y de P. brygooi y P. consimilis, donde se ubica en la mitad posterior. La especie nueva se asemeja a P. simarai Nigam, 1944 por la distancia entre los testículos, la posición del ovario y el espacio postesticular (30 y 36% de la longitud corporal). Sin embargo, difiere de P. simarai por el cuerpo de menor tamaño, por poseer faringe, ventosa oral y ventral, ovario, testículos y bolsa del cirro, todos ellos de menor tamaño y por presentar espinas pequeñas en el margen del collar y espinas de mayor tamaño en los ángulos del mismo. Adicionalmente, el ovario de la especie nueva se localiza inmediatamente anterior al punto medio corporal, mientras que en P. simarai, se localiza bastante adelante de dicho punto. Palabras clave: Digenea, Echinostomatidae, Patagifer lamothei n. sp., Eudocimus albus, ibis blanco, Texas, EUA. The white ibis, Eudocimus albus (Linnaeus) (Threskiornithidae), is a relatively common wading bird that is primarily found in marshes, mangroves, lagoons and shallow lake margins typically ranging from central Baja, southern California, Arizona, New Mexico, southern and eastern Texas, central Alabama, Florida, southeast Georgia, and coastal North Carolina south through the Bahamas and Barbados along both coasts of Central America, through the Greater Antilles, and along the coasts of South America to northwest Peru and French Guiana. It also has been occasionally reported from southern California, North and South Dakota, southern Michigan and Idaho, Wisconsin, southern Ontario, Nova Scotia, and Manitoba (American Ornithologists' Union, 1983). There have been numerous reports of endohelminthic parasites from along its range (Table 1), including a species of the genus Patagifer Dietz, 1909, Patagifer vioscai Lumsden, 1962, from Florida and Louisiana, USA (Lumsden, 1962; Bush and Forrester, 1976; Forrester and Spalding, 2003). The genus Patagifer (Nephrostominae Mendheim, 1943) was established by Dietz (1909) for Distoma bilobus Rudolphi, 1819 collected from the intestine of the glossy ibis, Plegadis falcinellus (Linnaeus) (Syn. Ibis falcinellus Linnaeus), from Europe. Yamaguti (1971) placed members of this genus in Echinochasminae Odhner, 1910, recognizing 13 species: Patagifer acuminatus Johnston, 1916 from the Australian white ibis, Threskiornis molucca (Cuvier) (Syn. Ibis molucca Cuvier), from Australia (Johnston, 1916); Patagifer bilobus (Rudolphi, 1819), the type species; Patagifer brygooi Richard, 1964 from the Madagascar crested ibis, Lophotibis cristata Boddaert, from Madagascar (Richard, 1964); Patagifer chandrapuri Srivastava, 1952 from the blackheaded ibis, Threskiornis melanocephalus (Latham), from India (Srivastava, 1952); Patagifer consimilis Dietz, 1909 from the buffnecked ibis, Theristicus caudatus (Boddaert) (Syn. Geronticus albicollis Boddaert), from Brazil (Dietz, 1909); Patagifer fraternus Johnston, 1916 from the Australian white ibis from Australia (Johnston, 1916); Patagifer parvispinosus Yamaguti, 1933 from the little grebe or dabchick, Tachybaptus ruficollis (Pallas), from Japan and Russia (Yamaguti, 1933); Patagifer sarai Saksena, 1957 from the blackheaded ibis from India (Saksena, 1957); Patagifer simarai Nigam, 1944 from the common spoonbill, Platalea leucorodia Linnaeus, from India (Nigam, 1944); Patagifer skrjabini Hilmy, 1949 from the glossy ibis from Egypt (Hilmy, 1949); Patagifer srivastavai Peter, 1954 (experimentally reared in pigeons) in India (Peter, 1954); P. vioscai from the white ibis from USA (Lumsden, 1962); and Patagifer wesleyi Verma, 1936 from curlew and ibis from India (Verma, 1936). Jain and Srivastava (1970) synonymized 3 species of Patagifer (P. chandrapuri, P. srivastavai, and P. sarai) with P. wesleyi. Two additional species, Patagifer toki described by Onda et al. (1983) from the Japanese crested ibis, Nipponia nippon (Temminck), from Japan and Patagifer plegadisi Sakla, Monib and Mandour, 1988 described by Sakla et al. (1988) from the glossy ibis, P. falcinellus, from Egypt have been erected, bringing the total number of possible species in the genus to 12. The purpose of this study was to provide additional information on the genus Patagifer in the New World. Eight white ibis, E. albus, (6 collected from Galveston, Galveston County, Texas, USA, between October and December, 1988 and 2 collected from the Navasota River near Bryan, Texas, USA, in September, 1999) were examined for parasitic helminths (U.S. Fish and Wildlife Service permits PRT 760668 and SPR 1191436; Texas Parks and Wildlife Department permit TX SPH 0491253). Flukes were studied alive, relaxed in saline, heatfixed under slight cover slip pressure in alcoholformalinacetic acid (AFA), stained in Semichon's carmine, and mounted in Canada balsam. Drawings were done with the aid of a drawing tube. Measurements are in micrometers (Î¼m), and are given with the mean followed by the range in parentheses unless otherwise stated. Comparative measurements were taken from the original species descriptions unless otherwise stated. Representative specimens were deposited in the Harold W. Manter Laboratory of Parasitology (HWML), University of Nebraska, Lincoln, USA. The following specimens from the United States National Parasite Collection (USNPC), Beltsville, Maryland, and the Natural History Museum (NHM), London, were examined: Patagifer bilobus (NHM 1929.7.24.151155, 1929.10.15.7277, 1954.9.14.301310, 1978.11.7.2236), Patagifer vioscai (USNPC 39099), and Patagifer spp. (NHM 1982.5.20.1241, 1993.1.29.2223). Ecological terms used follow Bush et al. (1997). Description based on 10 specimens. Body aspinose, large, 11.8 (10.013.0) mm long by 2.0 (1.92.2) mm wide. Forebody short, 1.4 (1.11.5) mm long (approximately 12% of body length). Oral sucker poorly developed, nearly absent in some specimens, 398 (300490) long by 399 (350445) wide with distinctly bilobed head collar, 1.1 (1.01.3) mm long by 1.6 (1.51.7) mm wide, bearing a total of 56 rodshaped spines with 28 spines per side (48 marginal spines and 8 corner spines; 2 aboral small spines and 2 larger oral spines per side). First marginal spine at bottom of dorsal incision poorly developed, variable in size, 30 (540) long by 22 (335) wide; second marginal spine usually more developed, variable in size, 65 (5090) long by 34 (3040) wide; spines on dorsal margin 113 (100130) long by 51 (5055) wide; spines on ventral margin 128 (120140) long by 55 (4560) wide; small, aboral corner spines 110 (100135) long by 46 (4060) wide; larger oral corner spines 157 (140170) long by 46 (4060) wide; last ventral margin spine overlaps corner spines in some specimens sometimes giving appearance of fifth corner spine. Acetabulum large, 1.5 (1.41.6) mm long by 1.5 (1.31.7) mm wide. Ratio of transverse diameter of oral sucker to acetabulum 1:3.7 (1:3.61:3.9). Mouth ventrally subterminal; prepharynx absent; pharynx 278 (236312) long by 233 (200279) wide; esophagus 503 (340660) long, bifurcating immediately anterior to the acetabulum; ceca terminating near posterior extremity, with numerous bulblike expansions present in entire postacetabular length. Ratio of transverse diameter of pharynx to oral sucker 1:1.7 (1:1.61:1.8). Testes lobed, tandem, separated by some distance (intertesticular space 485 [425575], approximately 4% of body length), in posterior half of body; anterior testis 994 (7751,438) long by 497 (425600) wide; posterior testis 997 (8751,100) long by 485 (437550) wide. Seminal vesicle enclosed in cirrus sac, 633 (580875, 5% of body length) long by 483 (400575) wide. Genital pore on midline of ventral surface of body, immediately anterior to acetabulum. Posttesticular space 3.5 (3.23.8) mm long, approximately 30% of body length. Ovary smooth, spherical, sometimes transversally oval, pretesticular, 435 (355495) long by 413 (375450) wide, located 595 (400775) from the anterior testis. Ratio of transverse diameter of ovary to mean diameter of testes 1:1.2 (1:1.11.3). Oviduct arises posteriorly from ovary; oötype dense, immediately postovarian 440480 long by 450680 wide, surrounded by numerous Mehlis' gland cells. Laurer's canal opens on dorsal surface immediately posterior to ovary on midline of body; canal proceeds ventrally into Mehlis' glands but can not be traced into female reproductive duct. Vitelline fields composed of numerous large, follicles extending along lateral margins of body from level of posterior margin of acetabulum to ends of ceca near posterior extremity. Uterus essentially preovarian, intercecal, initial portion filled with spermatozoa. Eggs 95 (91101) long by 56 (5265) wide. Excretory vesicle Yshaped, bifurcating immediately posterior to posterior testis; excretory pore terminal. Type host: the white ibis, Eudocimus albus (Linnaeus) (Threskiornithidae). Type locality: Navasota River near Bryan, Brazos County, Texas, USA, 30° 24' N, 96° 13' W.
Additional locality: Galveston Bay, Galveston County, Texas, USA, 29° 18' N, 94° 48' W.
Prevalence: 2 of 8 hosts (25%). Type specimens: holotype: HWML 48559; paratypes (2 specimens): HWML 48560; vouchers (2 specimens): HWML 48561. Etymology: the species is named in honor of Dr. Rafael LamotheArgumedo in recognition of his many contributions to our knowledge of the helminths of wild vertebrates. There are 6 species of Patagifer that have collar spine counts that are between 25 and 29 per side, including 4 corner spines on each side (the new species has 28 collar spines per side, with 4 corner spines on each side): P. bilobus (2629), P. brygooi (2526), P. consimilis (2627), P. fraternus (28), P. parvispinosus (26), and P. simarai (27). Three other species, P. acuminatus (2728 collar spines per side; reported as 25 per side by Yamaguti ), P. toki, (2426 per side), and P. vioscai (2628 spines per side) have similar collar spine counts, but these species have 3 rather than 4 corner spines per side. Patagifer skrjabini has 25 collar spines per side, but has 5 corner spines per side rather than 4. Patagifer wesleyi has more collar spines (3031 per side including 4 corner spines per side) than the new species. We could not obtain the description or specimens of P. plegadisi and therefore could not compare to this species. In our opinion, Patagifer plegadisi should be considered to be a species inquirenda until further investigations are available that will allow for the verification of this species. Unlike P. bilobus, P. brygooi, P. consimilis, and P. fraternus, where the testes are close together (contiguous to nearly contiguous), the ovary is close to the anterior testis (a distance that is less than the length of the ovary), and the posttesticular space is less extensive (2328% of the body length), the new species has the testes separated from each other by about the length of the ovary or more (intertesticular space 425575), the ovary positioned about the length of the ovary or more (400775) from the anterior testis, and the posttesticular space is approximately 3036% of the body length. In addition, the ovary of the new species is located just ahead of the midbody rather than being at midbody, as is seen in P. bilobus, P. fraternus, and P. vioscai, or below midbody, as is the case in P. brygooi and P. consimilis. The new species is most like P. simarai by having the testes separated from each other by a distance approximately equal to or greater than the length of the ovary, the ovary located some distance ahead of the anterior testis (about the length of the ovary or greater), and in both the new species and P. simarai, the posttesticular space is 3036% of the body length. The new species differs from P. simarai by having a smaller body size (10.212.9 mm long by 2.0 mm wide compared to 21.422.6 mm long by 3.1 mm wide); a smaller oral sucker (399 wide compared to 510 wide) and pharynx (233 wide compared to 306 wide); a smaller acetabulum (1.5 mm wide, 12% of body length compared to 2.1 mm wide, approximately 9%); a smaller ovary (435 long by 413 wide compared to 544 long by 476 wide); smaller testes (average width of the testes 491, ratio of the width of the ovary to the mean width of the testes 1:1.2 compared to 706 wide, 1:1.5); a smaller cirrus sac (633 long, 5% of the body length compared to 714 long, 3%); smaller spines on the margin of the collar (dorsal spines 113 long compared to 119 long; ventral spines 128 long compared to 140 long), but larger corner spines (largest spines 157 long compared to 115 long); and the ovary of the new species is located immediately anterior to the midbody, while in P. simarai it is located well ahead of the midbody. There have been 3 species of Patagifer that have been reported from the western hemisphere: P. bilobus from Argentina (e.g. reported from the whitefaced ibis, Plegadis chihi [Vieillot] by Boero and Led , Digiani , and Lunaschi et al. ); P. consimilis from Argentina (e. g. reported from T. caudatus by Boero and Led , and Lunaschi et al. ), and Brazil (e.g. reported from T. caudatus [= Geronticus albicollis] and the plumbeous ibis, Theristicus caerulescens [Vieillot] [= Molybdophanus caerulescens] by Dietz  and Thatcher ); and P. vioscai from Florida (e. g.; reported by Bush and Forrester , and Forrester and Spalding ) and Louisiana (Lumsden ), USA, from the same species of bird, the white ibis, as the new species. It is difficult to compare the new species to P. consimilis because the poor quality of his specimens prevented Dietz (1909) from providing a complete description of this species; however, in addition to the differences given above, P. lamothei n. sp. differs from P. consimilis by having a somewhat smaller body size (11.8 mm long compared to 13.0 mm long); a larger oral sucker (399 wide compared to 340 wide); a smaller egg (91101 long by 56 wide compared to 108.8115.6 long by 61.2 wide); a definite intertesticular space (separated by the length of the ovary or more) rather than the testes being contiguous or nearly contiguous ("close together"); more collar spines (28 per side compared to 2627), larger corner spines (largest spines 157 long compared to 108.8 long); and the new species has an unusually indistinct, poorly developed (nearly vestigial) oral sucker. In addition to the differences given above, the new species differs from P. vioscai, by having a larger body size (11.8 mm long by 2.0 mm wide compared to 8.6 mm long by 1.7 mm wide); a larger oral sucker (398 long by 399 wide; ratio of the width of the oral sucker to the width of the acetabulum 1:3.7 compared to 142 long by 230 wide; 1:6.6); an oral sucker (399 wide) that is wider than the pharynx (233 wide) rather than being of equal width (230 wide); a slightly smaller ovary (435 long by 413 wide compared to 486 long by 409 wide); larger testes (average width of testes 491 compared to 333 average width); the width of the ovary being smaller than that of the testes (ratio of the width of the ovary to the mean width of the testes 1:1.2) rather than being wider than the testes (1:0.8); a longer cirrus sac (633 long, 5% of body length compared to 512 long, 6%); a definite intertesticular space rather than the testes being contiguous; the ovary situated above the level of the midbody rather than being at midbody; a more extensive posttesticular space (3,547, 30% of the body length compared to 2,285, 27%); and the new species has an indistinct, poorly developed oral sucker. Most species of Patagifer are relatively similar in general morphology, making the differentiation of species difficult. One characteristic that is commonly used to distinguish species of Patagifer, as well as species in other genera of Echinostomatidae Looss, 1899, is the arrangement of the oral collar spines, that is, the number of spines on the collar and the number of corner spines present. In the genus, most species descriptions provide ranges of the total number of spines on each half of the head collar that range from a low of 2426 spines in P. toki to a high of 3132 in P. fraternus (reported as 28 spines per side by Yamaguti , but this count did not include the 4 corner spines). Collar spines can be difficult to count in echinostomes in general, but in most species of Patagifer the spines are fairly distinct and usually relatively easy to count, especially when there are several specimens available for examination. Although there may well be some variability in the number of collar spines present in any particular species of Patagifer, it appears that the ranges seen in at least some of the previous species descriptions may have been a product of descriptions being based on too few specimens, where spines were difficult to see, and/or where spines were missing (either lost, or they did not fully develop). In our specimens, the number of collar spines (28 per side) was constant, although the first spine on the margin in the dorsal incision was always the smallest spine (540 long by 335 wide), and in some specimens it was poorly developed and difficult to see. In 1 of our specimens this spine was originally thought to be absent, but after a more detailed examination, it was identified as a small, simple, almost circular structure that did not have a typical spinelike appearance. The second, and in a few specimens, the third spine on the margin, were also frequently smaller than those seen on the rest of the collar, and often these 2 spines were also atypical in appearance. The number of corner spines present in existing species ranges from 3 in species like P. acuminatus, P. toki, and P. vioscai to 5 in P. skrjabini. In our specimens, there were 2 small corner spines and 2 large corner spines on each side; however, the last ventral margin spine overlapped the 4 corner spines in some specimens giving the appearance of a fifth corner spine. Also, in a few specimens, 1 of the smaller corner spines was hidden behind a larger spine, giving the impression that there were only 3 corner spines present. While none of our specimens had missing spines, this is also a possible source of variations seen in spine counts in the genus. Many authors have used differences in the size of collar spines to distinguish species in the genus. This seems to us to be a promising characteristic for this purpose when used in conjunction with other characteristics. One problem with using the sizes of these spines is that it is often not clear in descriptions where on the collar the spines being compared were measured. In our specimens, the spines nearest the dorsal incision were smallest (see measurements above), those on the main aspect of the remaining dorsal margin were next largest (100130 long by 5055 wide), the dorsal spines on the margin were the largest marginal spines (120140 long), and the corner spines (4 per side) were composed of 2 relatively small aboral spines that were about the same size as the dorsal marginal spines (100135 long by 4060 wide) and 2 larger oral spines that were generally larger than any of the other collar spines (140170 long by 4060 wide). Such anomalies may also have played a role in the variability seen in some collar spine counts. We feel that our specimens also provide some insight into a third characteristic that may have potential in combination with other characteristics for distinguishing species in the genus. In our specimens, the testes are separated from 1 another by a distance that is about equal to the length of the ovary or more, rather than being contiguous or nearly contiguous. This characteristic was consistent among our specimens; however, specimens of species of Patagifer that we examined from museums included both expressions of this characteristic. For example, in specimens of P. bilobus (NHM 1929.7.24.151155) the testes were contiguous, while in other specimens of this species (NHM 1978. 11.7.2236), they were positioned some distance apart, as is seen in our specimens. As it is in many other digenean groups, we consider the position of the testes relative to each other to be a reliable characteristic for distinguishing species in the genus, and therefore we feel that it is likely that some of the specimens we examined from museums were misidentified. We also feel that the position of the ovary may be a reasonably reliable distinguishing characteristic among species in the genus when used in conjunction with other characteristics. In some species, the ovary is located either at or near midbody (e.g. P. bilobus, P. fraternus, and P. vioscai), or posterior to the midbody (e.g. P. brygooi and P. consimilis). In the new species, it is located some distance ahead of the midbody. One interesting observation concerning our specimens was that none of the 6 white ibis examined from the Galveston area of the Texas Gulf coast (marine environment) were infected with Patagifer spp., while both of the birds collected inland from the Navasota River (freshwater habitat) were infected with the new species. While our sample size was only 8 birds, this finding suggests that when birds frequenting freshwater areas are compared to those frequenting marine habitats in south Texas, the former may be more likely to encounter this species of Patagifer, and become infected by ingesting infected freshwater snails. Species of Patagifer are known to utilize freshwater (i.e. ponds and lakes) snails as intermediate hosts; a planorbid snail as a first intermediate host and a lymnaeid snail as a second intermediate host (Kostadinova, 2005). We are indebted to Dr. Keith Arnold, Department of Wildlife and Fisheries Sciences, Texas A&M University, College Station, Texas, for providing birds. We thank the Texas Parks and Wildlife Department and the U.S. Fish and Wildlife Service whose cooperation made this study possible. Mrs. Patricia Pilitt, United States National Parasite Collection, Beltsville, Maryland, was instrumental in letting us examine specimens of Patagifer from the USNPC. We also thank Mrs. Eileen Harris, the Natural History Museum, London, for allowing us to examine specimens of Patagifer from the NHM. We are indebted to Dr. Francisco Hernández, retired researcher, El Colegio de la Frontera Sur, Tapachula, Chiapas, Mexico; Mrs. Ixel Obregon Russ, 99 Eldora Drive, Mountain View, California; and Dr. Leasa Lutes, Department of Foreign Language and Linguistics, Gordon College, Wenham, Massachusetts, for their help in the translation of the English title and abstract into Spanish in our publication. This study was funded by a grant from the Schubot Exotic Bird Research Center, the Texas Veterinary Center, Texas A&M University.